NEW YORK, July 28, 2014 (Xinhua) -- The UN Security Council holds an emergency meeting on the situation in the Middle East, at the UN headquarters in New York, on July 28, 2014. 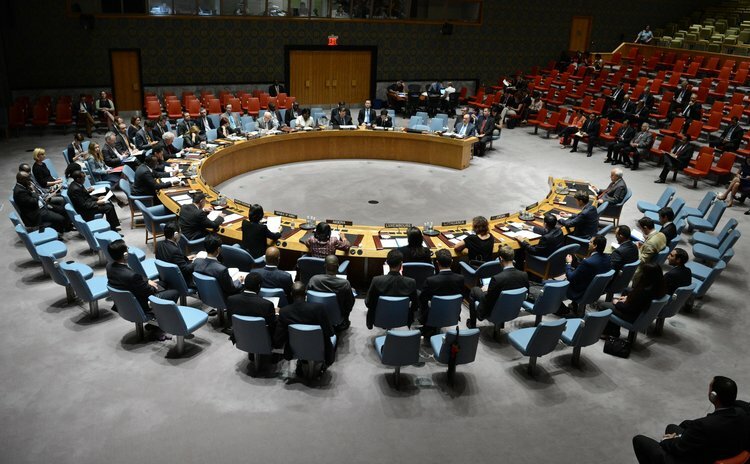 UNITED NATIONS, July 28 (Xinhua/Sun) -- The UN Security Council on Monday issued an urgent appeal to Israel and Hamas for an immediate humanitarian truce in Gaza, where more than 1,030 Palestinians and 43 Israeli soldiers were killed over the past few weeks. The appeal was made in a presidential statement adopted by the 15-nation UN body at an emergency meeting, the second late night session over the past weeks, which began at 0:04 a.m. EDT (0404 GMT) on Monday. "The Security Council urged all parties to accept and fully implement the humanitarian ceasefire into the Eid period and beyond," the statement said. In Arabic, Eid (Eid Al-Fitr) refers to "Feast of the Breaking the Fast" at the end of the Muslim fasting month of Ramadan. "The Security Council also calls on parties to engage in efforts to achieve a durable and fully respected ceasefire" in the region, it said. "The Security Council expresses grave concern regarding the deterioration in the situation as a result of the crisis related to Gaza and the loss of civilians and casualties," said the statement. The urgent council meeting came after a reported collapse of a UN-proposed humanitarian truce in Gaza. A Palestinian was killed and 10 injured on Sunday after Israeli war jets resumed airstrikes on Gaza, where a previous UN-proposed humanitarian ceasefire between Israel and Hamas collapsed. On Sunday afternoon, Hamas spokesman Sami Abu Zuhri said in an e-mailed press statement that Hamas and the Palestinian factions agreed to accept the UN-proposed ceasefire for 24 hours, but Israel rejected it. Efforts to reach a ceasefire between Israel and Hamas have so far failed, where Hamas Movement conditions any truce with ending seven years of an Israeli blockade imposed on the coastal enclave. "The Security Council emphasizes that civilian and humanitarian facilities, including those of the UN, must be respected and protected," the statement said. At least 15 people were reportedly killed in the Thursday attack on the school in Beit Hanoun, which was run by the UN Relief and Works Agency for Palestine Refugees (UNRWA). No less than 18 medical facilities, including 5UNRWA health clinics, have been hit by airstrikes and shelling. The Security Council "stressed the need for immediate provision of humanitarian assistance to the Palestinian civilian population in the Gaza Strip, including through urgent additional contribution to UNRWA," it said. More than 100,000 Gazans -- 5 percent of the total population -- have sought refuge in UNRWA facilities since the conflict began. Since Israel launched a large-scale operation on Gaza on July 8, 1,030 Palestinians and 43 Israelis have been killed and more than 6,000 Palestinians injured.